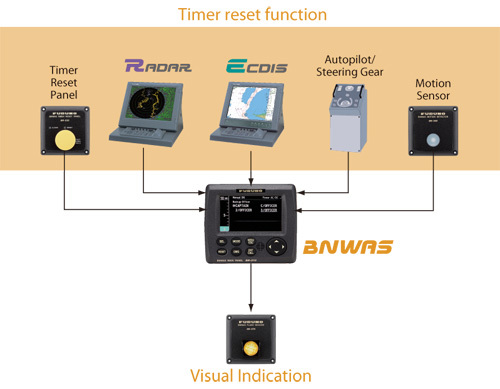 BNWAS monitors the watch officer’s presence through watch safety system functions. If the officer doesn’t respond to the alarm, the system transfers the alarm to the Cabin Panels installed in other sections of the vessel in order to inform backup officers of the watch officer’s incapacity. It is important to keep in mind when planning a BNWAS installation that the external devises, which can act as reset devises, need to be located in position where proper lookout can be done by the watch officer. For the motion sensor, it is critical to locate it in such a way that it cannot be activated by the ships movements. Thus, any curtains present on the bridge deck should not come in the way of the sensor. For first line of alert, in accordance with IMO Res. MSC. 128(75), sufficient number of visual indications (flashing lights) are to be installed and connected. The visual indications should be visible from all operational positions within the bridge where the OOW (Officer of the Watch) may be stationed to perform his duties. These positions are made up by, but not limited to, Conning work station, Navigation support work station, steering work station and 2 x docking work stations. Automatic: The BNWAS is automatically activated when the vessel is navigating by means of heading or track control system (autopilot/track pilot), and inhibited as the heading/track control system is deactivated.